Batteries: 1 AA batteries required. Founded in Sweden in 1884, Brio makes the highest qualitywooden toys that have delighted children and created happy memories forgenerations. Both educational and fun, Brio's uncompromising focus on design,quality and craftsmanship create toys of lasting value that stimulatecreativity and imagination. Engaging play and learning are integral themes inall Brio toys, satisfying a child's educational needs and growing with themthrough their various phases of development. Raise the draw bridge to let theloaded container ship sail into Brio harbor. Open the ship's hinged cargo baydoors to expose the precious cargo. Unload the ship with the multi-functionmagnetic crane into the waiting battery operated, motorized train. Pick up theload with the magnetic boom arm, slide open the box car doors and drop thecargo in for safekeeping. Once safely loaded, close the boxcar doors and pressthe button on the engine to power forward for the journey. Raise and lower thebridge by turning the bright red knob. And don't forget to open the safetygate at the bridge to let the train through. 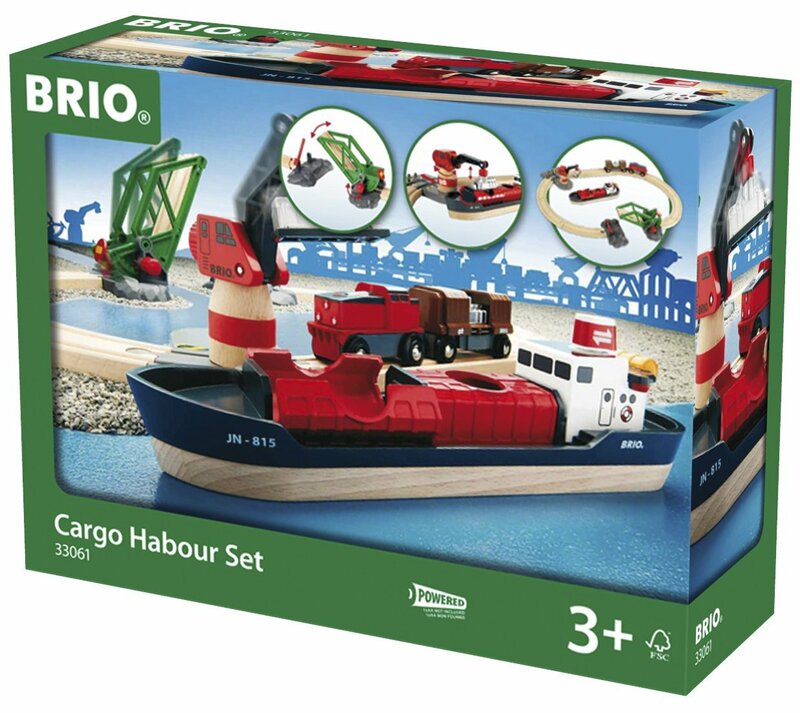 This 16 piece set includes thecontainer ship, train with motorized engine, boxcar with sliding doors,special draw bridge, pivoting crane, 8 track sections and three cargo loads.From the Manufacturer Founded in Sweden in 1884, Brio makes the highestquality wooden toys that have delighted children and created happy memoriesfor generations. Both educational and fun, Brio's uncompromising focus ondesign, quality and craftsmanship create toys of lasting value that stimulatecreativity and imagination. Engaging play and learning are integral themes inall Brio toys, satisfying a child's educational needs and growing with themthrough their various phases of development. Raise the draw bridge to let theloaded container ship sail into Brio harbor. Open the ship's hinged cargo baydoors to expose the precious cargo. Unload the ship with the multi-functionmagnetic crane into the waiting battery operated, motorized train. Pick up theload with the magnetic boom arm, slide open the box car doors and drop thecargo in for safekeeping. Once safely loaded, close the boxcar doors and pressthe button on the engine to power forward for the journey. Raise and lower thebridge by turning the bright red knob. And don't forget to open the safetygate at the bridge to let the train through. This 16 piece set includes thecontainer ship, train with motorized engine, boxcar with sliding doors,special draw bridge, pivoting crane, 8 track sections and three cargo loads.